Ahdarji, a Khajiit rogue, is a retired thief living in Leyawiin who now subsists by offering advanced Light Armor training. She is very prejudiced against Argonians, and will take any opportunity to rant about them. 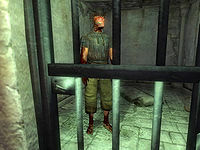 Even worse, one of them recently stole a precious heirloom from her; apparently a gift from her former partner Qa-Dar. She has called upon her guild to retrieve it. Retirement is as good as it gets, and Ahdarji lives a very relaxed life. She only sleeps six hours a day, however, probably due to her night-time job as a guild thief. After waking up at 6am, she wanders around her house before locking up at midday and leaving for a two-hour lunch at the Five Claws Lodge. After returning home for some more wandering, at 6pm she locks the door once again and heads to the Three Sisters' Inn for two hours of dining and chatting. Once she's full, she'll stand up and spend the next four hours still, conversing with the other regulars. At midnight, she calls it a day and heads back home. The only exception to this schedule is during the Drunk and Disorderly quest, when she will skip lunch and stay indoors to avoid the unruly Fighters Guild members at the Five Claws Lodge. She will be available for training from 6am to 6pm. She wears standard middle-class attire: a pair of light brown linens, a quilted doublet and a pair of pigskin shoes. She also carries her house key and a small amount of gold coins. She relies on a silver dagger and on either a Chameleon, Invisibility or Silence spell for protection. When you meet her for the first time she will introduce herself and mourn about her lost husband: "Yes. Ahdarji is the name. Poor Ahdarji, all alone, now that Qa-Dar is gone. Poor widow Ahdarji... Ahdarji trains, yes. Light Armor is the skill. Ahdarji must work very hard, now she is all alone in the world." When asked about Leyawiin her hatred towards Argonians becomes apparent: "So many greenskins here... they smell, do they not? Ahdarji won't drink the water, no. The Argonians SWIM in it." However, if the player is an Argonian, she will hatefully say: "You will not stay in Leyawiin. You just visit. Of course. Too many Argonians here. Already. People here don't like Argonians. Too many already. " As an advanced trainer, she will point you to J'bari for further training: "Speak with J'bari here in town. He's good with Light Armor; far better than I." "Make that filthy lizard suffer!" Once S'Krivva asks you to pay "the widow of a former fence" a visit, Ahdarji will change her greeting and simply say: "Why does the prey approach me?" When you ask her about the heirloom she will give you the full story about the Argonian she hates the most in all of Cyrodiil: "Yes. A filthy Argonian stole my precious ring. It was a gift from my mate. It has... sentimental value. I will pay well. The stupid lizard hunts with the name Amusei. Find him, find my ring. Make him suffer! Kill him and I will be pleased." When you remind her that the Guild frowns on killing people she will angrily say: "Stupid guild rules! He is only an Argonian. He is less than human, and much less than Khajiit. If you must spare him, at least make him suffer." After you have spoken to Amusei in the dungeon of the castle, Ahdarji will comment: "Amusei tried to sell it to Alessia Caro? Argh! Stupid lizard. Ahdarji uses ring much more wisely. I use it to collect and sell information. That ring can be used to read private messages the Count writes. Get me that ring. Steal it from Alessia Caro if necessary. Just bring me the ring. I will pay double!" When you finally hand over her precious heirloom she will be overwhelmed with joy: "My ring! All thanks to the claws of the Clan Mother. You have recovered it. Is that slimy Argonian dead? Did he suffer long? I hope so. You have earned the reward. The Thieves Guild was always good to Ahdarji's dearest mate. I am grateful that the memory is still honored." 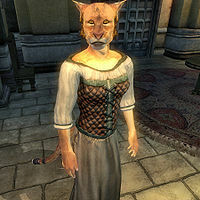 The townsfolk of Leyawiin have also noticed the Khajiit's strong hatred of Argonians. In their conversations, they can be heard saying: "Have you seen Ahdarji trying to start trouble? ", "Did you hear about Ahdarji picking another fight with an Argonian? ", "She's ridiculous. I don't know what her problem with Argonians is, but she's always trying to start something." and "I don't know what her problem with Argonians is. She's going to cause some real problems, if she's not careful." Light Armor Training: A master of light armor wants some new armor before he will train you. Ahdarji stands around doing nothing between 8pm and midnight because her AI package is set up as a "Travel" rather than a "Wander". Since she is already in the Inn, she ends up doing nothing. This page was last modified on 20 October 2015, at 05:14.